You've heard the old saw, "A picture is worth a thousand words." That can work both ways. It may take a thousand words to explain what's happening in a picture. A combination of pictures and story is ideal. Most people think of adding photographs to life stories, but there are several other kinds of pictures that add interest and value to the story. 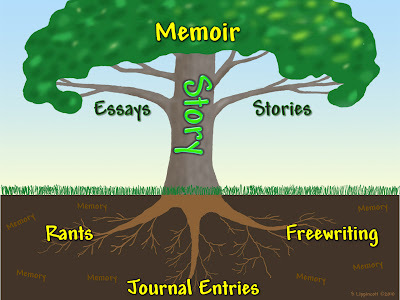 In The Heart and Craft of Lifestory Writing, I suggest including maps and floor plans with your stories. For example, I'm working on a compilation of stories about the first six years of my life. For most of that time we lived in the same house. 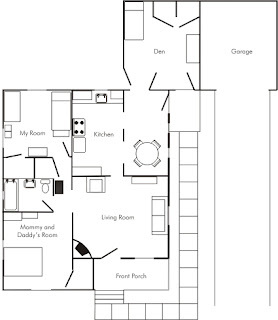 I will include this floor plan for that house, the best I can remember. I drew this on the computer, but graph paper and a pencil would have been lots easier! It isn't exactly right, even yet, but you can see that it was quite a small and simple house. When I pair this with photos like the one below that shows the front of the house, the fireplace, or other spots in the house, the whole story takes on more depth. I may also include map scans of the neighborhood and Albuquerque. I could include shots of flowers we had in the yard. I could include all sorts of things, both written and visual. Last September I did a post that included a crayon drawing of the back yard as I remembered it. How do you make decisions about what to include? The same way you decide what written details to include. Decide what the purpose of your story is, and what focus you want it to have. If I want to focus on the logistics of learning to roller skate, I may want to find a picture of the sort of adjustable, clamp-on skates I had. If I'm more focused on the sensations of wild wobbling, the heaviness of the pillow my mother strapped around my boney tush to ease my tumbles, the cutting pain of the tight ankle strap, and my stubborn determination to stick it out in spite of the skinned knees, I will skip the picture. I hope I've given you some new ideas for illustrating your stories, and a little guidance in deciding which are the most appropriate for your purposes. I just happen to have a photo of the house I grew up in before any renovations were done. A hugh Snowball Bush dominates the left front and the Honeysuckle vines the right. I just decided to make this picture the cover for my stories of growing up there with an invitation for the reader to...come on in. Funny; you made even the cracks in the sidewalk reappear. Certain ones were to be avoided when we roller skated. Stay at it Sharon. You keep waking us up. Sharon, when I have taught life story writing, I have the people in classes each draw a floorplan of a house from their childhood. Then I break them up into pairs and each takes his ot her partner on a tour through the house. It is always one of the exercises people like best. Thanks for an always great blog! Something that this post reminds me of is how much I struggle to clearly recall the floorplan of our first house. I remember parts of it well, but sitting down and drawing it out with my parents or one of my sisters would be hugely helpful. That would take away the fuzzy edges that now exist in my recollection of those other parts of the house. 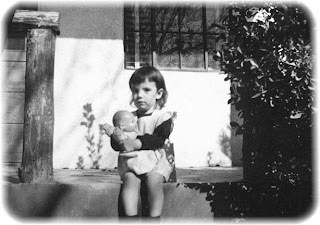 p.s., I love the photo of you and your doll! Thanks for all the comments. Herm, that book cover will be spectacular. Stephanie, I'll use your idea in my very next class. Ybonsey, I'll bet your whole family will enjoy having that house plan. Sure wish I knew what became of that doll. I might have traded her to the Indians for some beads that I still have.